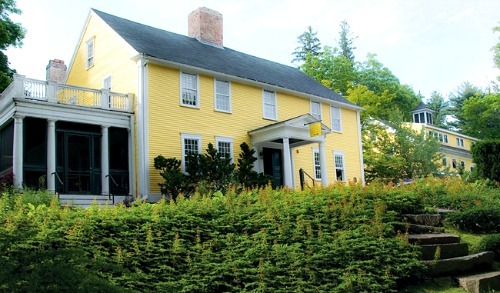 The building which is now known as the Three Chimneys Inn was constructed in 1649, and it is the oldest building in Durham and one of the oldest in New Hampshire. The house was built by an entrepreneur in the area called Valentine Hill who originally made a single story with a basement and an upstairs living area which was also combined with the kitchen. Valentines son, Nathaniel made a two story addition to the House in 1699, which now forms the front entrance to the two dining areas. The house has passed through a number of families through its years until it was bought in 1997 by Sagamore Hill, Inc who completed restoration on the property. The house is now operating as a rather impressive and classy venue for weddings and events, as well as the usual offerings of food and beds. The Three Chimneys Inn is thought to have a number of ghosts residing here, though the exact number or even a rough number is not known. But one things for sure and that's that whoever is here certainly likes to make themselves known. Non more so than a spirit called Hannah, who is thought to be the granddaughter of the original owner who was Mr Valentine Hill. Its thought that she drowned in the near by Oyster river while playing one day. Soon after her death the towns folk started to report seeing the ghostly figure of a young girl near to the river and round the outside of the house. The tales of Hannah and her antics have not slowed down since her death. She is by far the most active ghost in the Inn and possibly the most active ghost in the state, but luckily she seems to be of good nature. Stories of her making herself know are plentiful to say the least, such as one night when the Karen Meyer who was the Innkeeper and one of her staff saw an empty glass float several inches off the table into the air before falling to the ground. Tales like this may sound a little over the top, but the shear amount of witnesses to Hannah's antics suggest there is definitely a presence here. Other tales of Hannah making herself known include her affectionately touching peoples hair, something she seems to like doing alot, especially to women but always in a friendly way. She also seems to like placing objects were she prefers them, often moving single items around the room or even into different area in the building. Single-handedly her favorite thing she likes to do to be noticed is to play with electronics, especially phones and computers. Tales of printers which keep printing after they have been unplugged and perfectly working lights flickering without reasonable explanation. Stories of her tampering with electronics range from calculators running numbers backwards to equipment just flat out not working in anyway for small periods of time. It seems she especially doesn't like new electronics in the Inn as these always seem to be targeted more heavily then the older gadgets. The main attraction for fans of the paranormal would certainly be to come and try to see Hannah, even though its thought there are a number of different spirits here she is certainly the most active. The other experiences people have had here include footsteps walking along empty corridors up to people doors only to fall silent when reaching them, and the sounds of heavy furniture being dragged across empty rooms on the upper floors, all though the furniture is always in the same place when checked on.